Does a bedroom consist of a room of any size upstairs? On main level? In basement? Does a bedroom need a door, window, and closet only? What “DOES qualify as a bedroom? Confused? I bet most real estate agents are as well…. Let’s define a bedroom before we go any further. A bedroom is a room of “adequate size” – which is defined as no less than 100 square feet. It must have a closet, a window, and a door; it must be heat/cooled and finished to the same quality as the rest of the house. It must be ABOVE GRADE to be counted as a bedroom. And the most forgotten or unknown factor in defining a bedroom is that it must have ready access to a FULL bathroom. A full bathroom is one that has a shower or a tub as well as sink and toilet. Think about it: if you have a bonus room finished up over a garage, it may have a closet, window, door, heating/cooling, and is finished to the same quality as the rest of the house. If you have to go down the stairs and across the house to use the bathroom, though, the room cannot function on a long-term basis as a bedroom. Another common scenario is that you might have four “bedrooms” on the second floor of a house. Three of the bedrooms have private baths. How is someone in the fourth bedroom supposed to get to the bathroom? If you answered “by going through one of the other bedrooms”, you are incorrect. You aren’t incorrect. It just doesn’t count as a bedroom. That does not function on a long -term basis as a bedroom. We would instead call it a den or office. Probably the most common scenario is as follows: let’s take a traditional two-story house. On the first floor, you have a living room, dining room, kitchen, one half bathroom, laundry and a “bedroom”. The problem here is that the “bedroom” is only serviced by a half bath. Again, this does not function on a long-term basis as a bedroom. 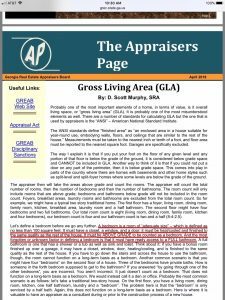 Here is where it is valuable to have an appraiser as a consultant during or prior to the construction process of a new house.